Participating in our meat CSA has been a great way for us to support local farmers, promote responsible animal treatment, and try new cuts of meat since you often get a variety box each month. During our last pick-up, we got a rack of pork spare ribs. 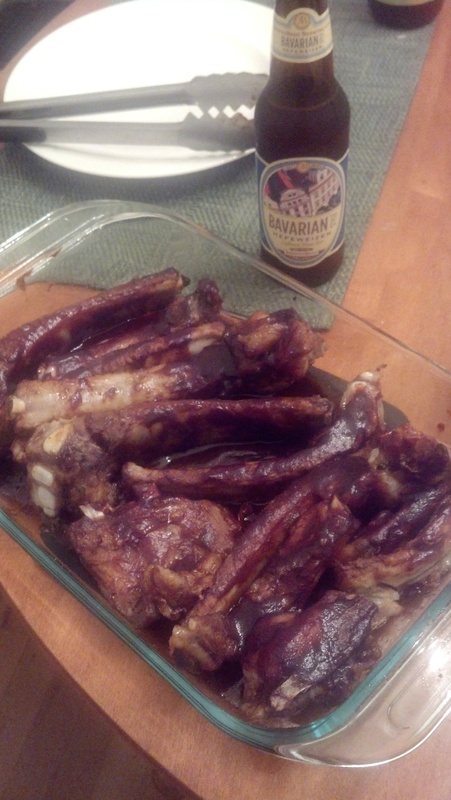 I have eaten spare ribs before so I was not too intimidated when I pulled out the large rack. I kept thinking of all these fancy ways to prepare the ribs but it never happened since I just didn’t seem to really have the time. After a couple of days passed, I decided to go the easy/quick, but still tasty, route with the ribs. 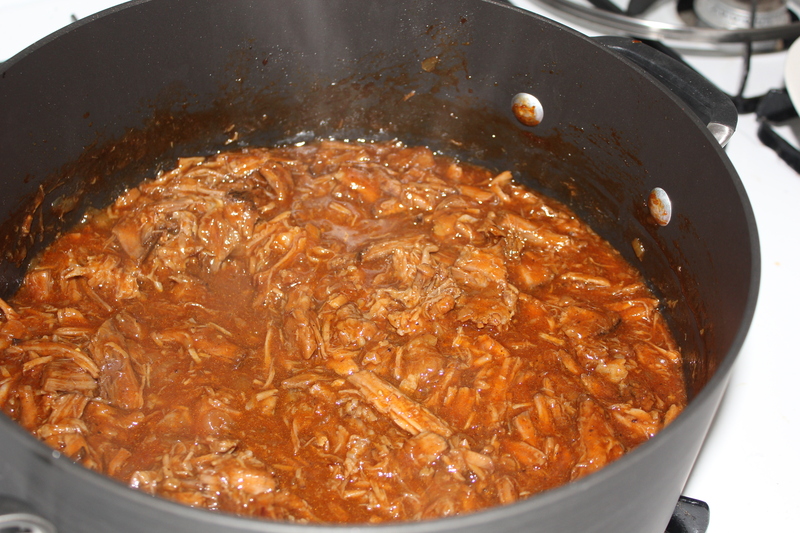 Your favorite BBQ sauce- we decided to try a trader joes brand sauce. 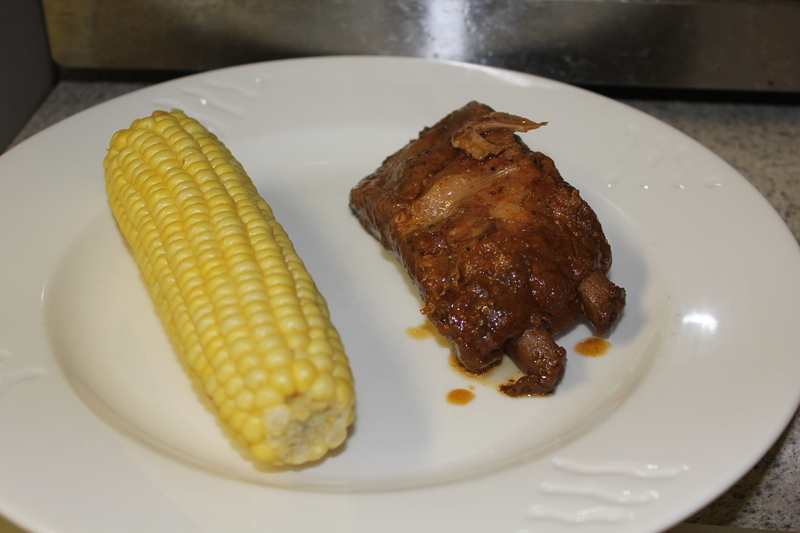 I served the ribs with some corn and of course a couple of cold beers 🙂 Eric LOVED the ribs and even said it was “blog worthy.” There are definitely benefits to cooking bbq slowly, but these ribs still turned out tender and yummy. Plus not many people have time to spend hours cooking ribs, especially on a week night…well, at least I do not have that kind of time. Boiling the ribs beforehand ensures that the meat is cooked and made tender. This past Saturday was our scheduled meat csa pickup from our neighborhood farmers market. The morningside farmers market has really grown in the past few months with many new vendors and interesting finds. I woke up early Saturday morning for a run, planning to stop by the market and pick up our meat. Taking a quick break at the market was actually really beneficial since I was still feeling the residual effects from my coughing/sniffling from the day before and running congested is rather difficult. It was also starting to get warm outside and that hot, heavy air is just awful. (Welcome, summer in Atlanta!) Lucky Eric got to complete the remainder of the run with 10lbs of frozen meat in his backpack. I was very impressed as he zipped up the hills back to our house. We got some ribs from our meat csa so we decided to pull out the slow cooker and make BBQ ribs. 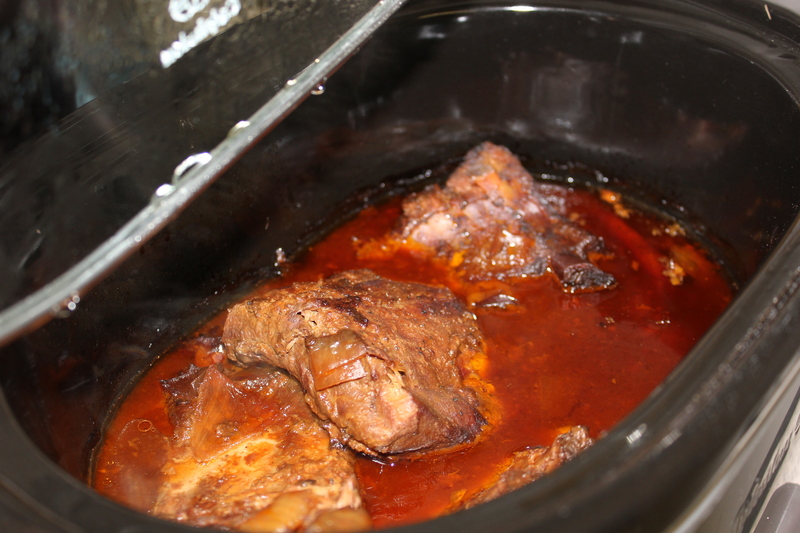 The slowcooker has been a dinner saver for our busy weeks. Really, if we didn’t have the slow cooker, I’m pretty sure our dinners would be ramen or pbj sandwiches. Another thing I love about our slow cooker is that it is a black and ceramic so its dishwasher safe and it there isn’t noticeable staining from sauces. 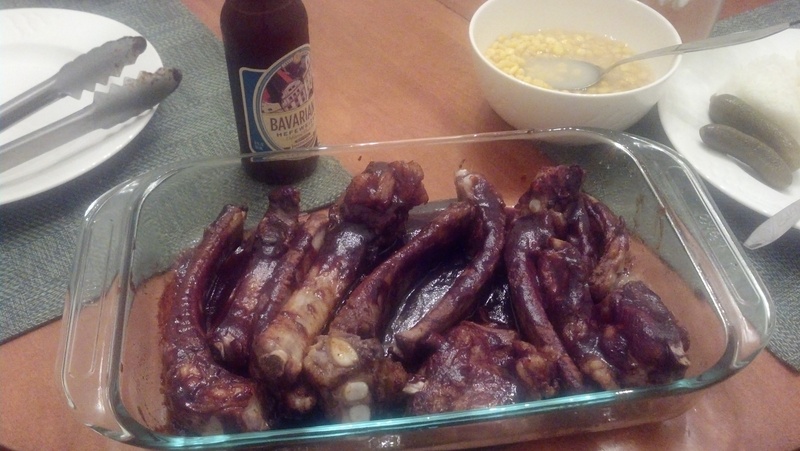 We bought some corn from the farmers market and had a nice BBQ dinner. One of the items from our meat CSA was a chuck roast. The last time I had this cut, I ended up making pot roast. I happen to really enjoy pot roast but it isn’t Eric’s favorite dish. 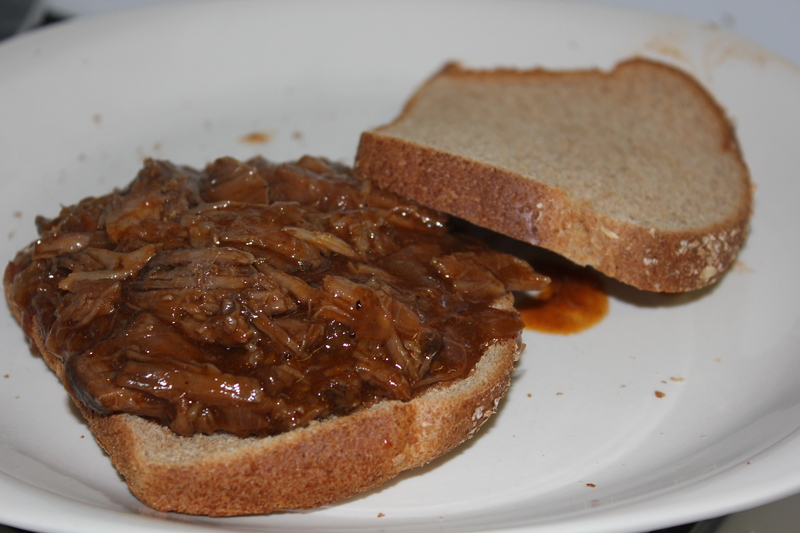 So I decided this time around I would prepare the roast the way he likes it, bbq braised chuck roast sandwiches. Unfortunately, our slow cooker is still in MD. We got one as a gift but it is still at my parents’ house since we never drove it down to Atlanta. I would have to prepare this over the stove meaning I needed to start early if we were going to eat dinner at a decent hour. Due to our lack of grocery shopping mentioned in an earlier post, we do not have many ingredients to make an elaborate bbq braised roast but luckily Eric enjoys a simple recipe and I enjoy easy to prep meals. All that was needed was a tbsp of olive oil, chopped onions, 18oz bbq sauce (I love sweet baby rays), a bottle of beer, and a chuck roast. 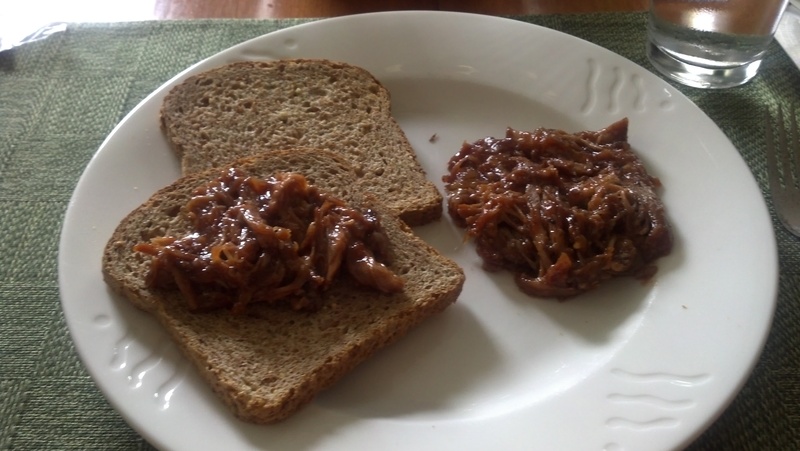 I tossed the onions in with olive oil, cooked for a few minutes, then added the bottle of beer and the bottle of bbq sauce. Let it simmer for a few minutes then add the roast. Let it simmer for ~3hrs. I flipped the pieces half way in cooking to make sure it was all covered in sauce. Once it is done, take the meat out and shred it. 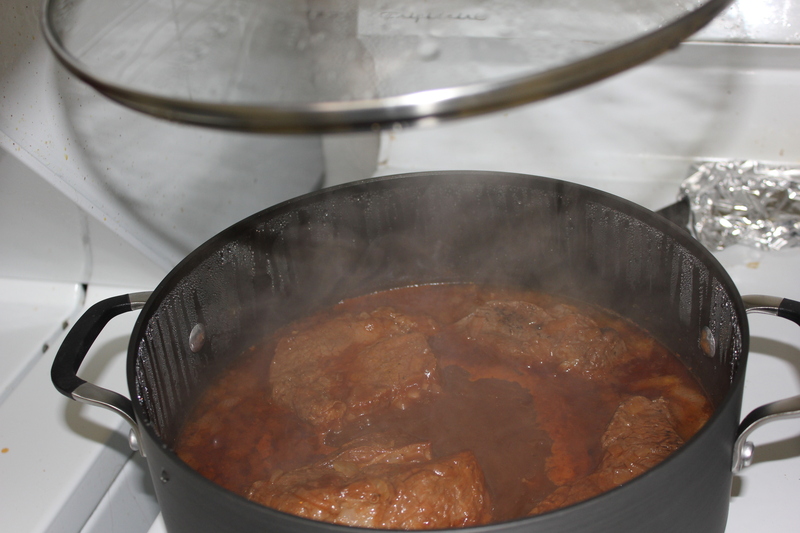 Turn the heat up a little for the sauce to thicken while you are shredding the meat. Add the meat back into the sauce and you are all done! We didn’t have rolls so Eric made a sandwich with regular sliced bread.